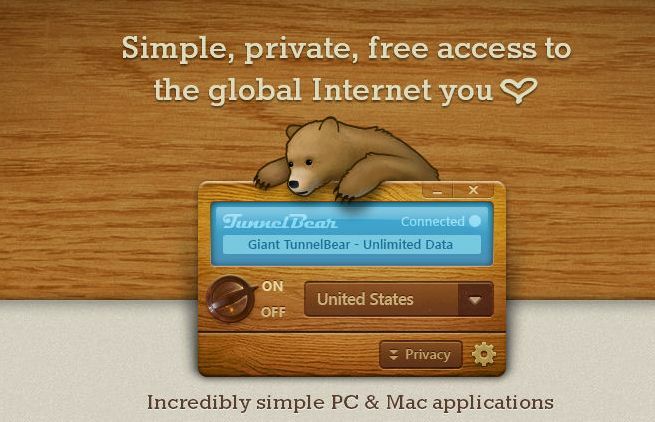 TunnelBear is a VPN service based in Toronto, Canada, that has been extensively reviewed in publications like PC World, the Huffington Post, and the Wall Street Journal. At the most basic level, TunnelBear is completely free to use. For a small monthly fee, you can get unlimited service and more devices. There are no device tiers, but if you purchase a year at a time, you can get 17% off. TunnelBear offers simplicity, both in terms of tunneling services and pricing. 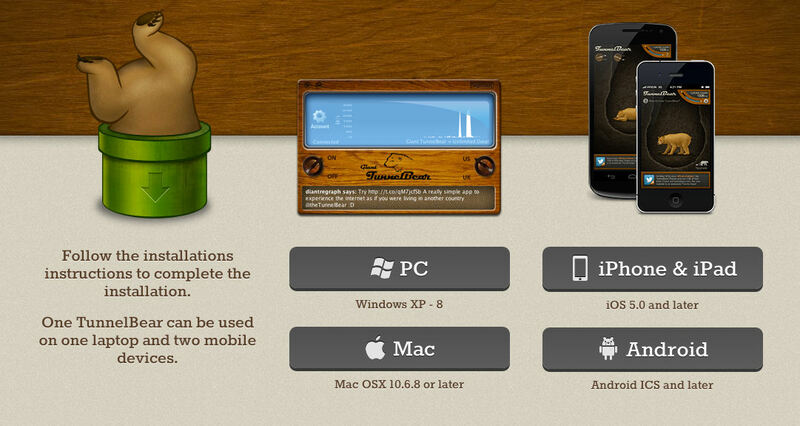 TunnelBear is available not only on PC and Mac, but also on your mobile device. Both the Android and iPhone apps are very highly rated downloads on Google Play and iTunes. One thing you will notice about TunnelBear right from the off is that this VPN is definitely aimed at the consumer end of the market. You will see very little in the way of technical jargon on the site, and the TunnelBear user interface has been designed to offer a minimalist, streamlined experience browsing online. • You are on a public network, and you do not trust that your privacy is protected. Browsing with a VPN like TunnelBear allows you to encrypt your transmissions. • Your network is blocking certain websites and applications, and you want to get through. • Certain content is blocked in your country, and you want to bypass censorship and get access to the rest of the web. TunnelBear allows you to browse as if you were located in another country. That way you can get access to all the content you want. • You are looking for a VPN which will allow you to tunnel on more than one device without paying an extra fee. One great thing about TunnelBear is that your license covers three devices. Let’s take an in-depth look at TunnelBear’s features to see if this is the right VPN software for you. Microsoft Windows: Windows 7/8, Vista. Mac: Mac OSX 10.6.8 or later. iPad, iPhone, and iPod: App available for iPhone and iPad, iOS 5.1 and later. Because TunnelBear is supported on so many operating systems, you should be able to use it on most devices without a problem. This includes your PC or Mac or your iPhone, iPad or Android. If you have a license for TunnelBear, you are allowed to run it on your PC or Mac as well as two additional mobile devices. If you pay for the “Giant” account (or the “Grizzly” account), you are allowed unlimited bandwidth on all three devices that you use. TunnelBear offers a free “Little” account. Download the free version of the program, and you will be given 500MB of free data to use each month. 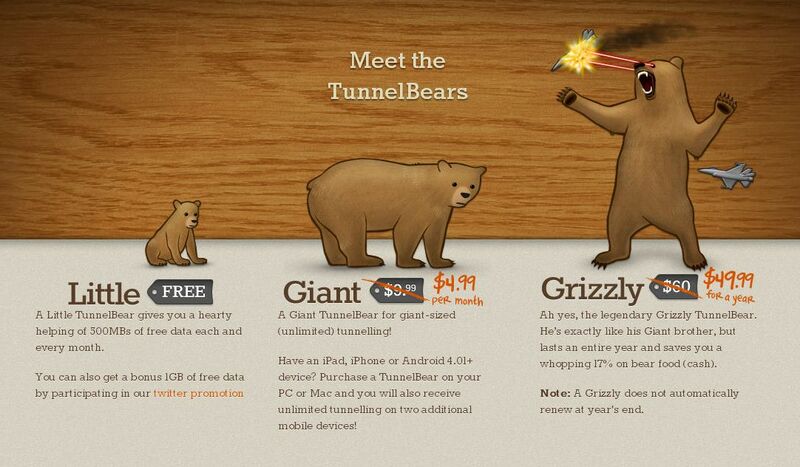 Additionally, TunnelBear offers a promotion which allows you to get an additional 1GB of free data. All you have to do is click “Tweet for a FREE GB!” in the user interface for the program, and post a tweet about TunnelBear. You will then receive a free GB for participating. • Browse privately and encrypt your transmissions using 128-bit AES. • Choose an IP address in the USA, Great Britain, Canada, Germany, Japan, France, the Netherlands, Italy, and Australia (Australia is available to paid users only). The free TunnelBear account is quite nice for basic tasks and includes full functionality, but if you need unlimited bandwidth (for example, for gaming or streaming video), you can upgrade to the Giant account for just $4.99 per month. This gives you unlimited bandwidth on up to three devices. If you want to enjoy a 17% discount, you can purchase a year at a time for $49.99. This is 17% off the monthly cost, and saves you a lot of money over the course of the year. If you are interested in using TunnelBear exclusively on your mobile device, you can purchase a mobile-only plan with a different pricing scheme. You can get one month for $2.99, 3 months for $7.99, or a full year for just $29.99. This is an excellent option which will allow you to save a lot of money if you are only using TunnelBear to protect your privacy when you are on the go and cannot use your own private network. There is no refund policy stated on the company’s website. Being as you can preview the service through the free version for as long as you want though, it is pretty easy to make an informed purchase decision. There is no official data from TunnelBear on the number of IP addresses available in the pool, but you do have the freedom to choose your own. Seven countries is not a whole lot in terms of diversity, but should work fine so long as you don’t mind that the service is Eurocentric. If you need to access the internet from an Asian or South American IP address, you will need to check into other options. Otherwise, TunnelBear should be able to serve your needs. As mentioned previously, the free version of TunnelBear, while fully functional, does limit you to 500MB per month. You will run through this very quickly if you are using streaming media or if you are gaming. Once you upgrade to a paid account, you can enjoy unlimited bandwidth. 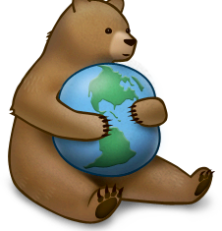 If you are a highly technical user looking for lots of advanced settings and controls, TunnelBear probably will not satisfy your needs. If however you are looking for something which is really simple and easy to use, you will have no problem understanding the TunnelBear user interface. On the whole, users are very pleased with TunnelBear and report few drops or disconnects in the service in their reviews. This leads us to conclude that TunnelBear is a very stable and reliable VPN service. A speed test on TunnelBear on a connection with a download speed of 6.90 Mbps showed a drop to 6.11 Mbps. This is less than one Mbps drop, so that is not a major decline in performance, though it is a decline. TunnelBear also admits openly on their site in the knowledge base that performance can drop when accessing the web through the VPN. The knowledge base predicts that speed will be within the 75-85% range. Whether this will be fast enough for you depends on how fast your connection is to begin with and what you want to do with it. In the above scenario, you would be fine to view streaming media or play games with 6.11 Mbps. According to the knowledge base, TunnelBear uses “a minimum of AES 128-bit encryption.” The protocol which is used appears to be OpenVPN, which is standard for applications like this. Specific IP addresses are never associated with unique users, and TunnelBear only holds onto the minimum amount of information necessary to keep their service running smoothly. You will notice there is no “Contact” area on the TunnelBear website. This does not change after your register. Everything is handled through the TunnelBear application. You can use the “Forgot your password?” button in the application itself to recover a lost login. TunnelBear keeps up with customers via social media channels like Facebook and Twitter, providing timely notifications of outages and maintenance. You can reach the customer service team directly through social media or through email. Customer reports about TunnelBear’s customer service indicate that the company is responsive, but can be a little bit slow. If you submit an email inquiry, it may be several days before you receive a response. Unfortunately there is no telephone number, so you cannot get in contact with the company in a timely manner if you have an urgent problem. TunnelBear has a number of pros and cons, but on the whole appears to be one of the better VPN services out there, paid or otherwise. 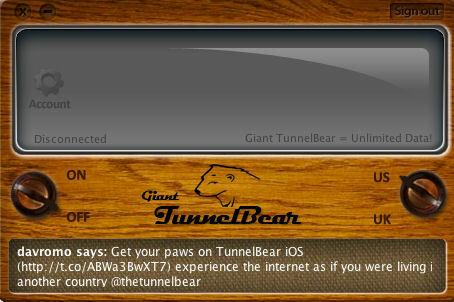 On iTunes, the TunnelBear VPN app has more than 450 votes and a rating of 4.5 for the free version. On Google Play, the free app is even more popular. More than 16,850 users have cast their votes at this time, rating the Android app with 4.5 out of 5 stars. • Slow customer service and no telephone number. • Download speeds may decline while running TunnelBear. • Eurocentric; no servers in Asia or South America. • Stable, reliable and secure access to the Internet. • A simple, streamlined user interface which is friendly to the not-so-tech-savvy. • Fully functional free account. • Low pricing for unlimited bandwidth and multiple devices. The TunnelBear VPN service has a strong reputation and is used by customers all around the world. There are only a few disadvantages to TunnelBear, but there are many benefits to using this VPN program. If the minor drawbacks don’t deter you, and you are searching for a simple, minimalist approach to tunneling, you will find TunnelBear a reliable, user-friendly answer to your needs. I think their billing dept is on acid.